Need help! Want mean exhaust! RE: Need help! Want mean exhaust! lt headers, x pipe, and some aftermarcket mufflers and you will hear mean! I just installed Ford Racing Stingers today and Im in love with em. Mac boom tubes are the only way to go. Trust me, much louder, deeper, and meaner than any other exhaust in real life. I had loudmouths for a few weeks and those were good but when I got my JBA longtubes and h-pipe my phone started ringing with complaints. If you want a real loud sound you need longtubes, no doubt. If you are looking for a throaty, nasty sound i would forget the cats. I kept my cats and its still mean but a little more rounded sound. My whole set up was only $1500 including install. 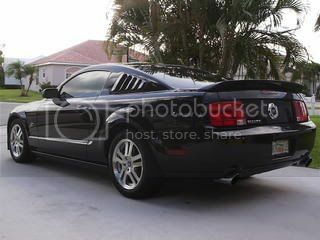 Exhaust for my '05 GT??? Quick Reply: Need help! Want mean exhaust!